Bequeathed by Myles Burton Kennedy, Esq. 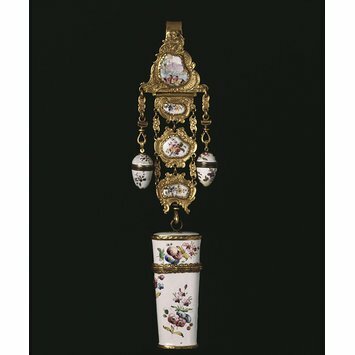 This type of waist-hung ornament is commonly called a chatelaine, but this term was adopted only in the early 19th century. It refers to a medieval châtelaine, or lady of the castle, and by extension, her bunch of keys and other useful items. The 18th-century name for this item was 'equipage', and its main component was normally an étui (a container for small tools), or sometimes a watch. 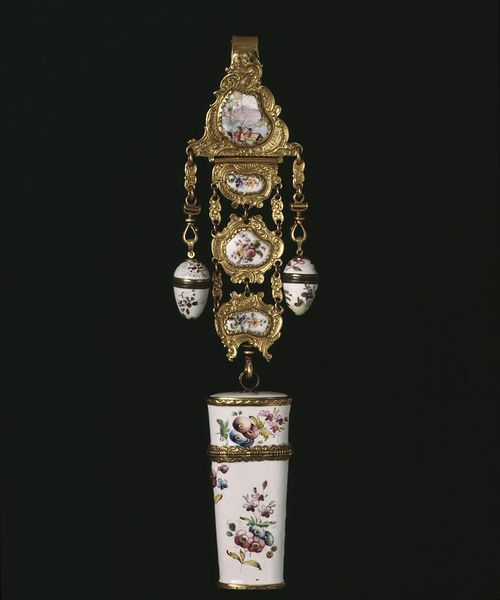 The main element of this chatelaine is an étui, a container fitted with a penknife, a bodkin for threading ribbon through lace, a combined nail-file and tweezers, and a combined toothpick and earscoop. Because these items are a selection from a fairly standard list of étui equipment, it is possible to tell from the shape of the remaining empty slot that this étui once also contained a hinged pair of ivory memorandum leaves (these could be written on, using a pencil). The small egg-shaped screw-top containers known as breloques may have been for small breath-freshening sweets. Chatelaines were not just attractive ornaments for ladies; their contents were useful too, and not unlike today's manicure sets, sewing kits and Swiss army knives. Mid-18th-century chatelaines were usually made from gilt metal, an alloy such as pinchbeck, or silver and gold. They were often ornately embossed with Rococo scrolling and sometimes had mother of pearl or agate panels. Enamelled chatelaines are comparatively unusual. They were quite complex to assemble, and few West Midlands workshops, except enterprises as large as that of Boulton & Fothergill of Birmingham, were capable of producing all the components, including mounts and enamelled parts. This is therefore the product of a larger factory, or if from a small workshop, a composite of parts bought in.